This past Tuesday I, like many others, stopped by Trader Joe's on my way home. I thought, armed with a shopping list, this would be a short visit. I was wrong. What greeted me were bare shelves and an almost empty meat case. Did empty shelves greet you when you went grocery shopping after the holidays? Or did you prepare by stocking up for the holidays? A brief aside. I've never stocked up for the holidays. In fact, I laughed when I'd read a Twitter stream considering why in preparation for holidays people attacked markets as if it was an emergency (for example, hurricane). After this year's experience (a resupply of inventory wasn't scheduled until Thursday), I'm definitely not going to let my cupboards go bare. Our refrigerator and pantry will be well stocked! I missed the last boneless, skinless chicken breasts by a mere second when a woman leaped in front of me and snatched the last two. (You can probably guess what I was planning to make for dinner: Chicken with Lemon Caper Sauce - Take 3. Alas, it was not to be.) The remaining pickings were slim. Luckily, I discovered a steakhouse seasoned beef Filet Mignon Roast, tucked under a few individual steaks. In our gas oven, 35 minutes was a little too long for medium rare. I'd forgotten to insert our meat thermometer earlier and discovered too late that the internal temperature was already 150 degrees. I don't typically make roasts so I'm not sure how much marbling the meat should have. I would think more marbling more tender meat. 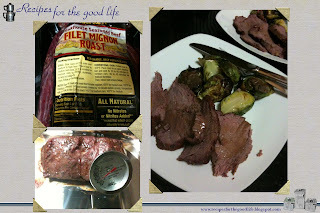 The roast I picked up had very little fat or marbling and yielded only a little meat juice. To add moisture to the roast I supplemented the pan drippings with chicken demi-glace, crushed rosemary, and a slurry of goat butter and flour. With the cooking time and resting period (45 to 50 minutes in our oven) this makes for a late weeknight dinner. I'd try this pre-seasoned roast again but on a weekend. This isn't actually a "roast," it's a beef tenderloin! It's not supposed to have marbling. I've bought and made this so many times I can't count, and it's been fabulous each time. Made it today with roasted potatoes, onions and carrots. Smelled divine.